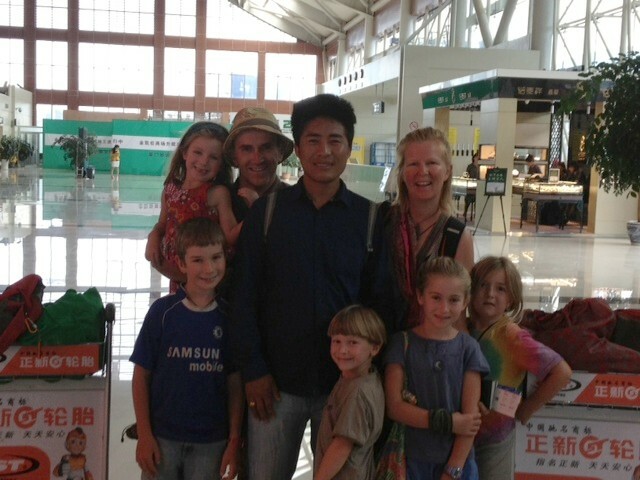 It was sad to leave Yeshi and Kham at the airport in Lijiang. We had photos with them before we said goodbye before we went through security. 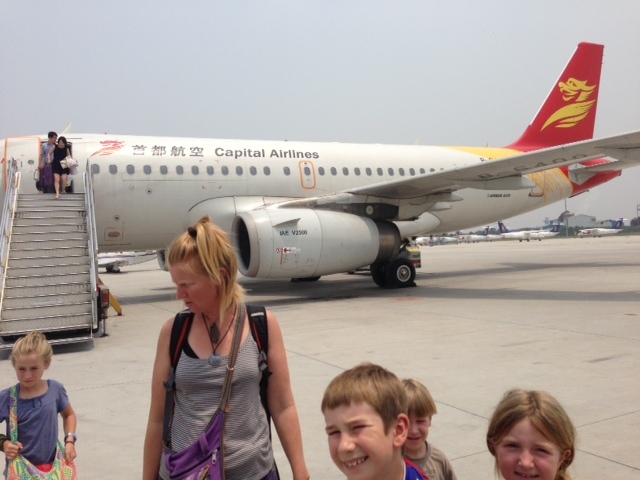 We went on Capital Airlines (my 8th airline) to Xian in the middle of China. 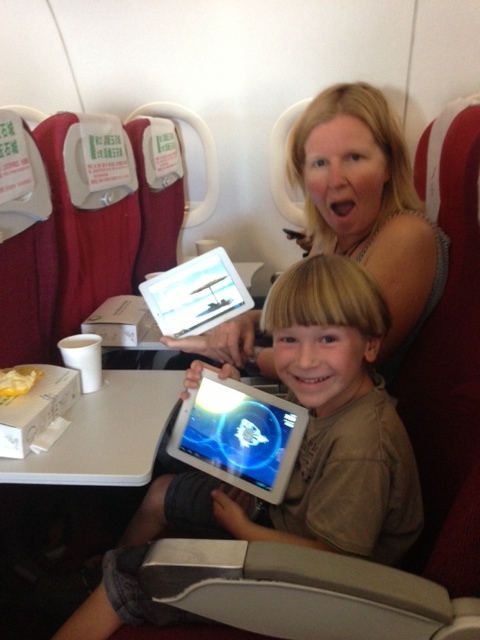 Instead of TVs they had ipads and I got to play Angry birds for the first time ever – it was awesome. Everyone on the plane was playing on the ipads in the plane except dad – he read a magazine – or looked at the pictures because he can’t read (just joking – it was in Chinese). In Xian we stayed at an awesome hostel called the ‘Hatang Hostel’ and it had table soccer. I called it the ‘awesome hotel’. For dinner we went to the sister hotel up the road. It had pool and table tennis and a small golf putting thing. There was a turtle there and I picked it up – it folded its body inside. 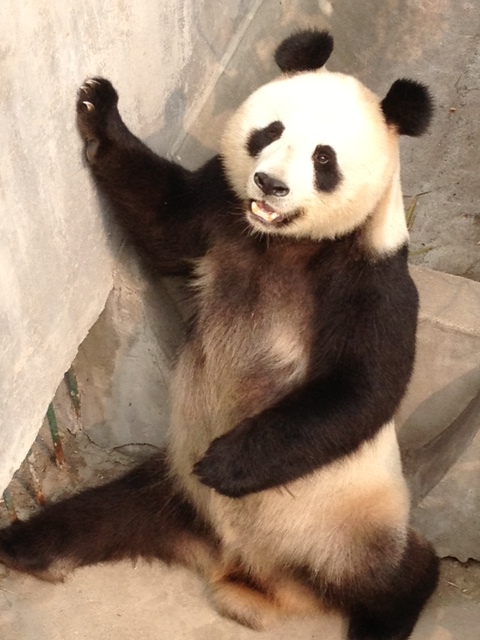 We went on a tour of a Panda Rescue Centre. 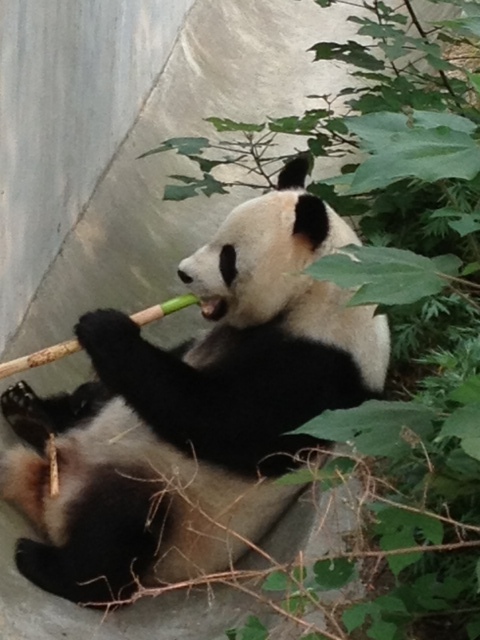 We saw red pandas black & white pandas brown & white pandas. 0ne jumped up & stood up she folded her head to her legs and wrapped her hands around her head she looked sad. 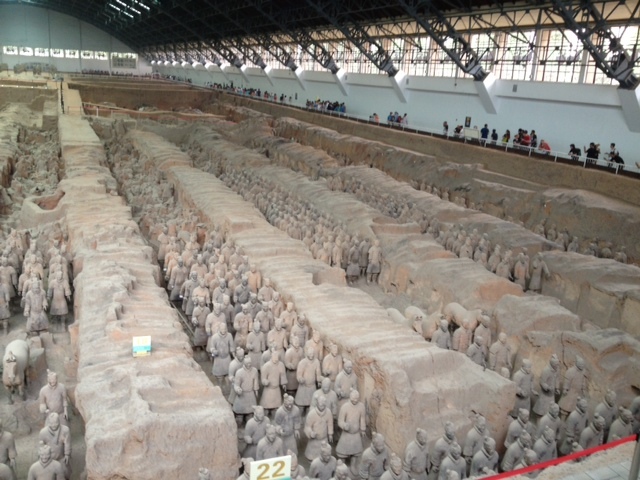 We went to the Terracotta warriors that were made 2000 years ago. They looked very old. It started by a farmer digging for water and he found a head. The village moved away and heaps more Terracotta warrior parts were found. He had a prize of just 10 Yuan (which is just under $2). 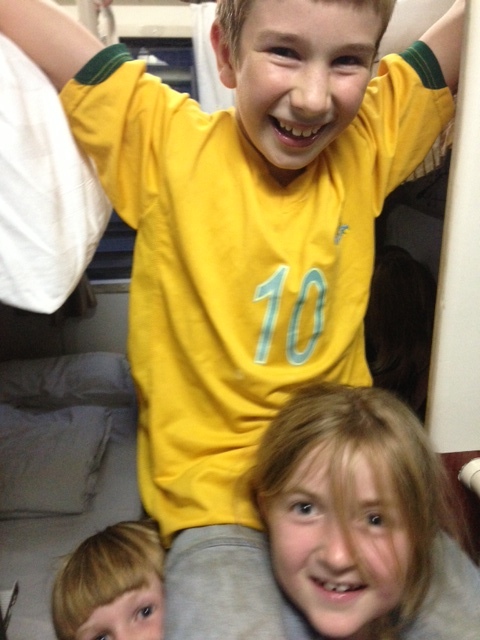 I went on an overnight train to Beijing. There were cute Chinese baby twins next door to us. The Chinese can have more than one baby if its twins so I say ‘one pregnancy’. Imagine if they had triplets! There were bunk beds and TVs. In the morning at the train station we had two beggars that were begging for money and we said ‘no’ because we were tired – a bit sad. 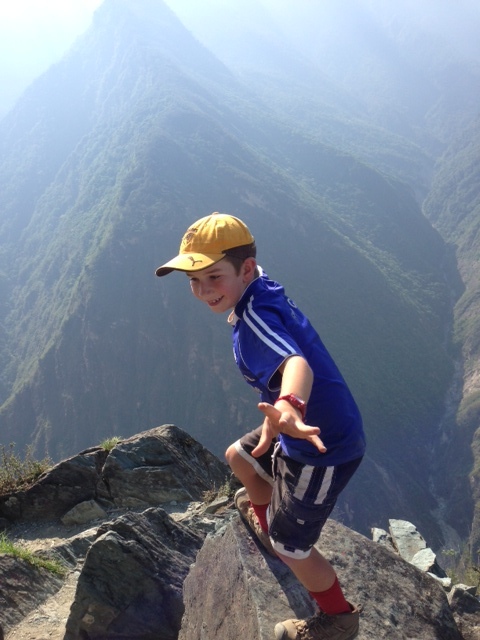 At the Tiger Leaping Gorge we did 3 days of 3-5 hour hikes. 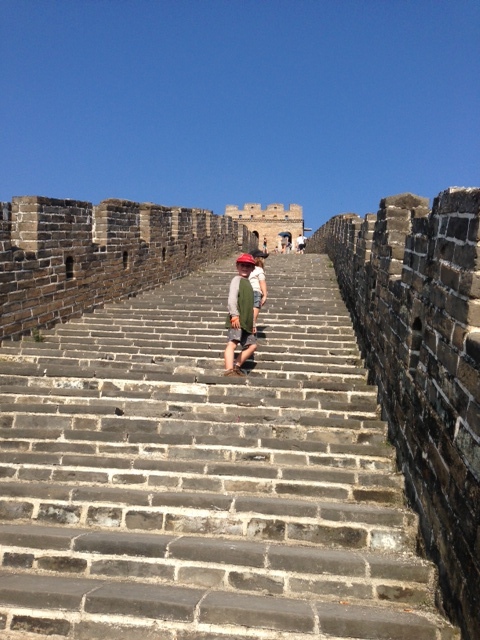 The first one was on a 36 C day in the afternoon up steep hills so it was very very hot. So part of the way we walked and then the little kids started getting really tired so we hired two horses for them. 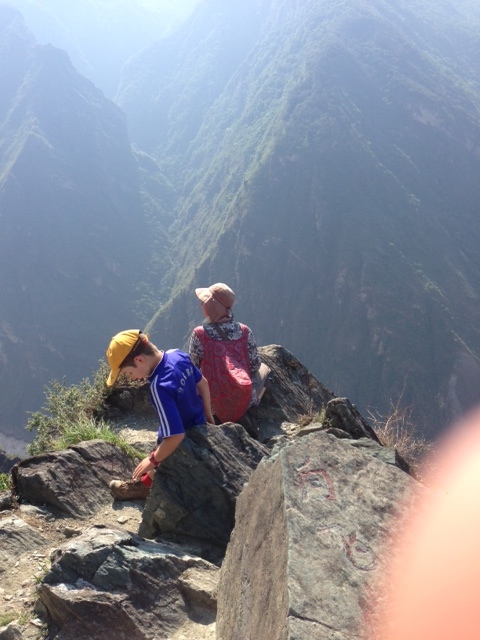 The views were amazing – I never knew that the Yangtze ran through the Tiger Leaping Gorge so I thought the Gorge would be cleaner than the muddy brown water of the Yangtze. It is because it is the wet season and lots of mud flows in. 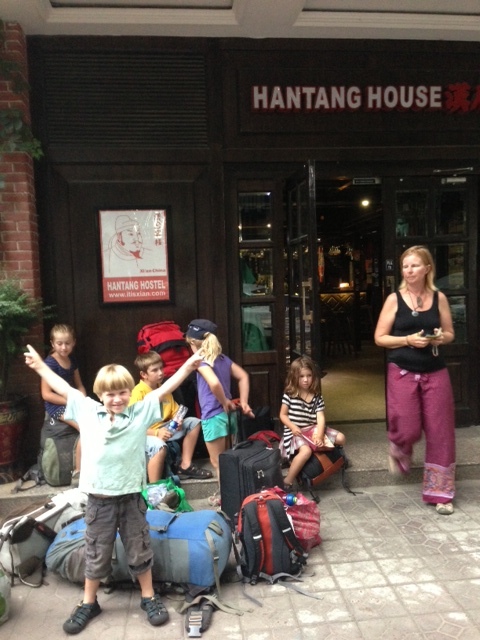 The first place we stayed was called the Naxi Guesthouse. It was fun because there was good Chinese Food and wifi so we could play ‘Words with friends’. There was a local kid at the guesthouse so he had lots of bikes and little cars that we loved playing on in the courtyard. The view of the mountains was great because I love looking at mountains with snow. The second day we hiked up a lot – there were 28 bends and they were long and fun because I loved calling out to all the others and counting the bends. The walk down to the Teahorse guesthouse was long after the 28 bends. I had to wait for 10 minutes on my own waiting for the others cause I was so fast. 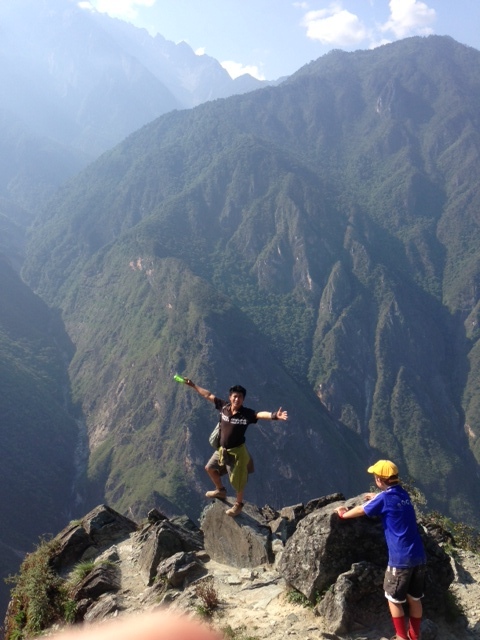 Yeshi showed us the tiger Leaping stone – where the tiger jumped from one side to the other – that’s how the Tiger Leaping Gorge got its name. When we were meeting up with our driver Kham we had to walk over a landslide and the bulldozers had to stop while we walked over this big hill of messy stone. Lucky it happened at night and no one was hurt. 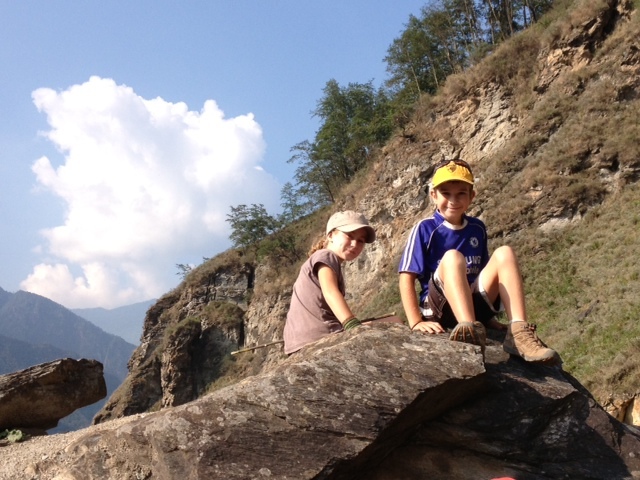 Lucky there are no landslides at our house in Whitfield but the Tiger Leaping Gorge is much steeper. 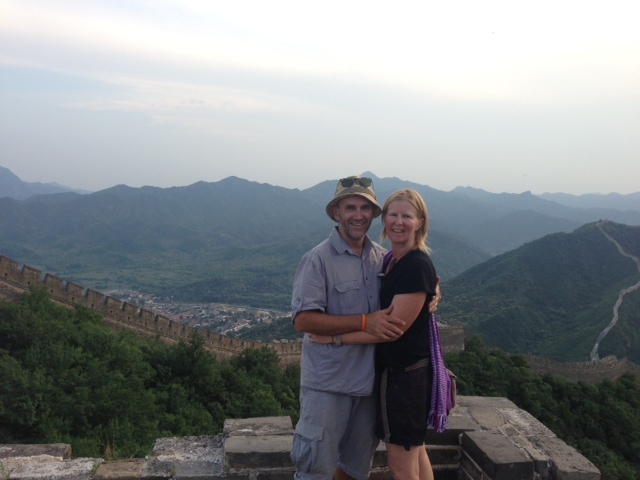 Back Roads of China is a travel company that our friends Liss and Bergs put us onto – one of the best organised and passionate people I’ve come across. I normally avoid travel companies and prefer to do it alone though. 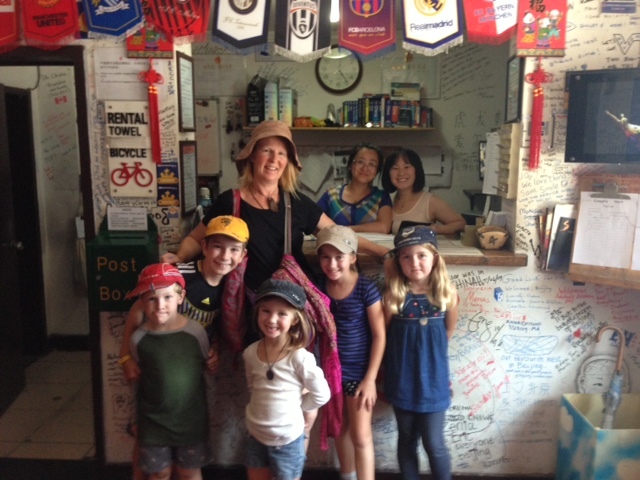 Since they were highly recommended and it’s a bit different traveling with kids in a new country where your language ability stops at ‘hello’, ‘thank you’, ‘twins’ and numbers, we decided to go with them and had a personalised 2 week tour prepared for us through Yunnan province. The things we did, the experiences we had and the people we got to meet – well there is no way we would have even had a snippet of that on our own. If you are ever coming to China and want to do more than just see the Great Wall and the Terracotta Warriors or go shopping in Hong Kong – get in contact with them and also not expensive either. 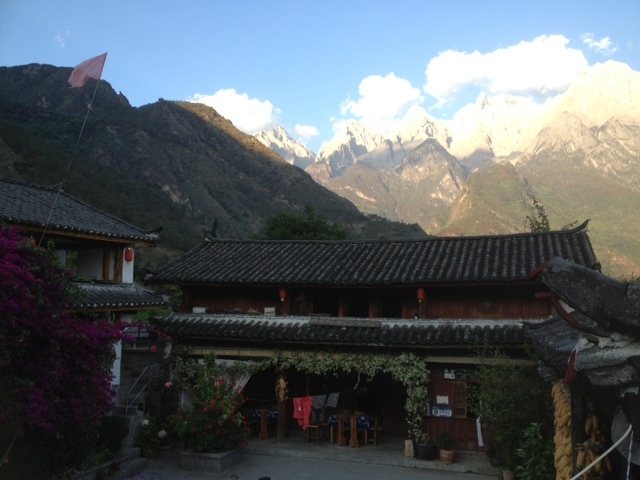 They even organised all our China train tickets, flight from Lijiang – Xian tickets – everything was looked after so well. We had a mix of beautiful guest houses, home-stays and camping. 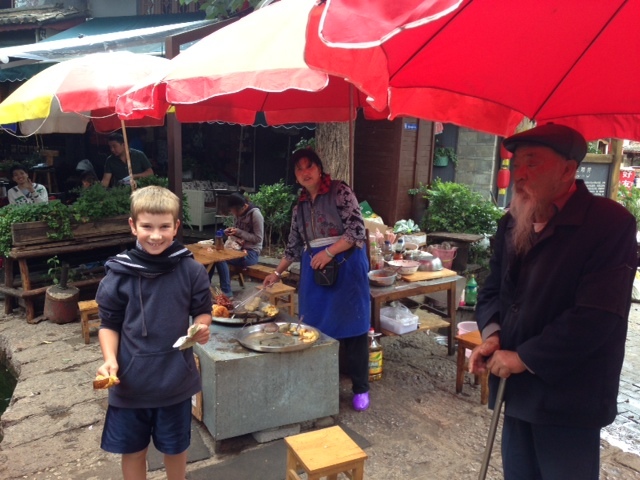 Our guides were Alex (who runs Back Roads of China with his Aussie wife Tania) in Kunming for a day (that was one of the kids’ favourite days when we went to the Stone Forest) then for the rest of the time we had Yeshi for about 2 weeks. We really bonded well with Yeshi – he was patient, adaptable as things didn’t always run to schedule with the kids eg- walking up 2300+ steps took a tad longer than the usual 2 hours, he always picked yummy food for us and was so knowledgeable. He spoke great English cause he studied in India as a young refugee before returning to China as a young adult. We really miss him. 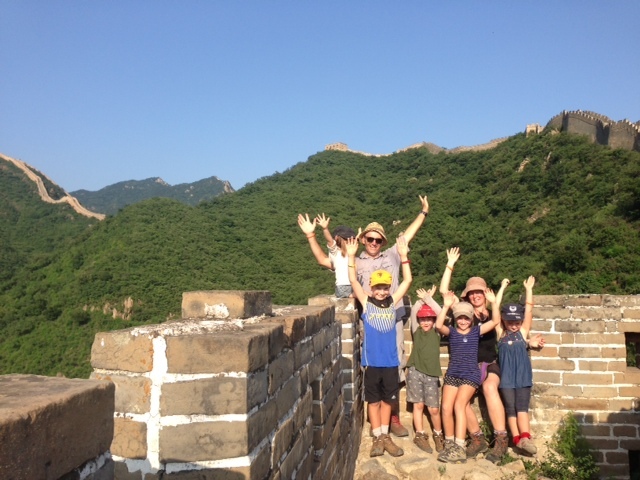 There were so many highlights from that trip which the kids have written lots about (and there’s more to come that they’re writing) but I think most I enjoyed the homestays and the physical feats of hiking that we achieved with the kids. 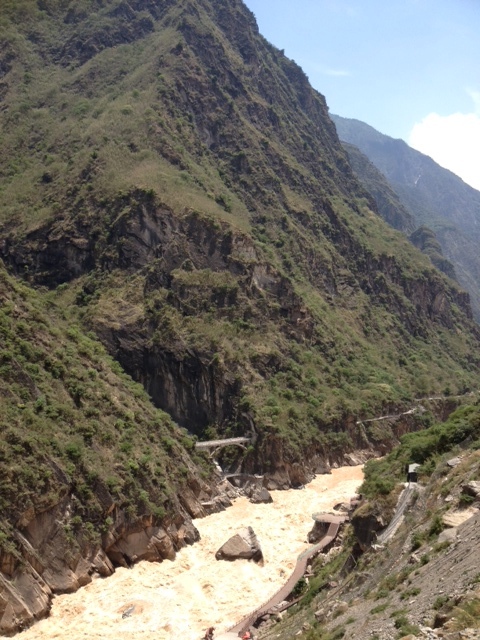 The Tiger Leaping gorge was incredible – what an amazing view to be able to see 3000m difference from the Yangtze in the gorge below and the towering snow covered peaks above. Truly amazing! Often on the walks I would hear the kids talking about all the things they were going to do when we arrive home. The way they were going to re-arrange their rooms, build horse stables etc. and I would think, just soak this in guys. I remembered when I was a young traveler and how I would often dream about all the things I wanted to do when I got home – some which were achieved, other dreams changed and I thought – well that is all part of travelling! To dream of things to come while enjoying the present – it sometimes helps you to put things into context. One thing they have been dreaming of though is my mother’s cooking! Tania, Alex & Yeshi definitely introduced us to a China that was way beyond what we expected and that we thoroughly enjoyed. Thank you so much. 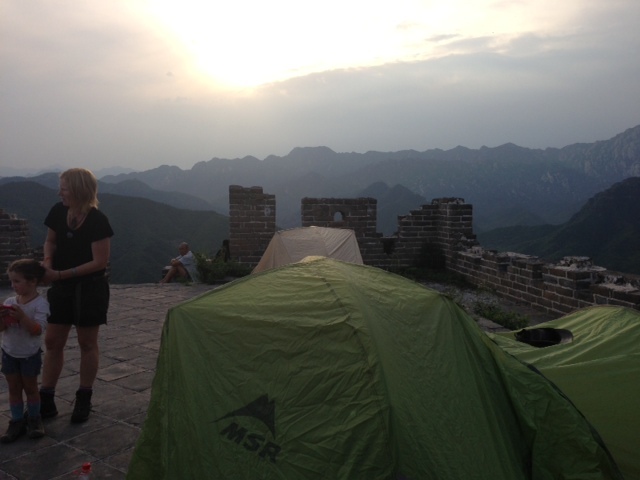 Hi – we are camping on the Great Wall of China at the moment and it is startlingly crazy and awesome and unbelievable all at once. 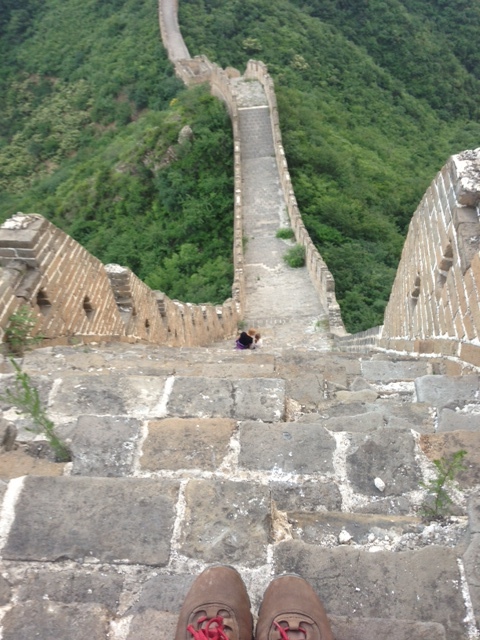 I just can’t believe they could build something like this – it’s so huge and long and absolutely the steepest path I have come across – its not like they tried to weave in and out of mountains they just went straight up and then straight down. On some parts I was trying to use my geometrical eye to guess the gradient and there were times where it was definitely over 60 degrees and we were on all fours. We came with 5 other travelers from our hostel – from the US, Britain and French Canada – and we’re on a pretty remote part of the wall – only a few other Chinese tourists on the way. We’ve only had to walk two kms before we found a flat landing to set up our tents. There are so many well placed arched windows pointing down so the soldiers trying to keep out the Mongols could shoot through without being shot – our resident pirate – Emilio – thinks this is great and creating vivid stories in his mind. To see the incredible sunset we decided to walk/climb up a few more posts to the top of the mountain and the sunset view was definitely worth it though I walking along thinking – ” they are just crazy – who would even think of building something like this here? Why didn’t they go around the mountain at this point?” I guess if they went around the mountain they couldn’t see the enemy coming or it would have been easier to be attacked. All very interesting and mind-blowing. 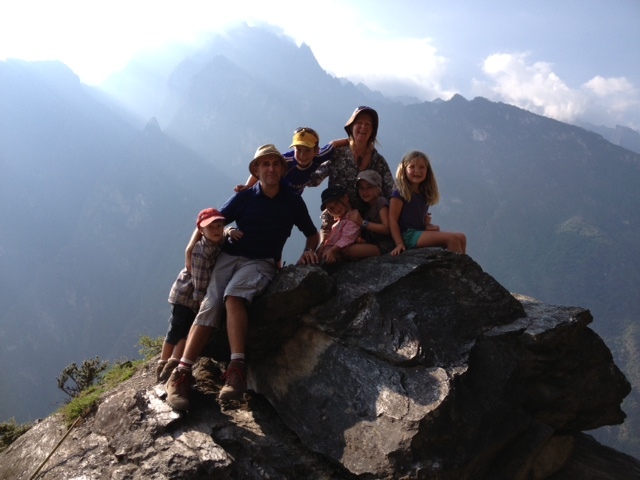 The kids thought it was amazing and I was surprised at their energy levels but they also loved having other travelers around – they just didn’t want to stop talking to them – and when they had told them our whole life story they started songs from the ‘Sound of Music’. Sandy and I thought that maybe they’re like this because they’re getting bored of us. The other thing that’s crazy is its only 5.30am right now but it has been light since 3.30am which to me means ‘change your time zone’ but no – China is definitely a one time zone country – I guess it’s much easier to control things that way and creates less confusion. The birds are chirping, the squirrels are busying themselves collecting Buddha knows what, and our last day in China is about to begin……. 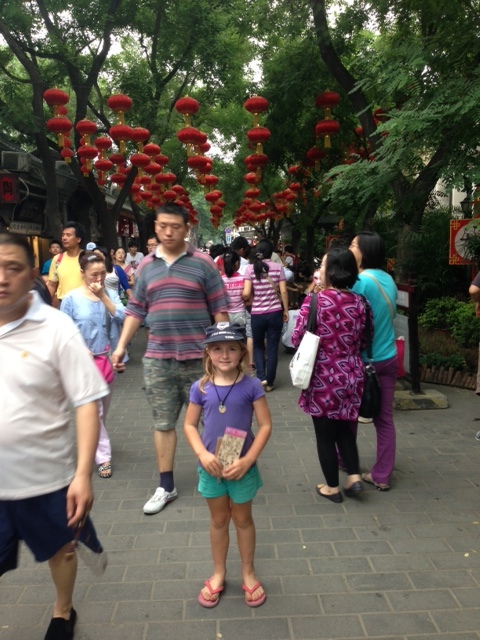 I really like Beijing – initially we were wondering how we could try and avoid it completely cause we generally don’t love the big cities (New York City being a major exception) – but it has quite a nice feel – despite the smog! Originally we thought maybe we could go through north eastern China into Kazakhstan though we definitely didn’t want to miss Mongolia so unless we had our own transportation & a guide who was going to deliver us to the border then Beijing it had to be. It is quite groovy, very fashion conscious and reminds me a bit of 1990s Japan. There’s definitely a feel of new found wealth and increased living standards. Also how could you miss Ikea, Zara, the Gap, the biggest Apple store (which apparently makes more money than the Manhattan shop which is open 24/7), Louis Vuitton, Chanel, every corner either having a McDonalds, KFC or Starbucks etc – all great hallmarks of a communist society on a capitalist steroid. 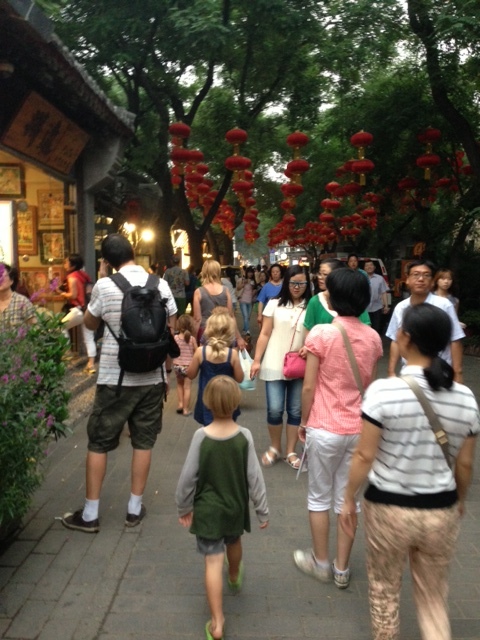 The place where our hostel is is a groovy little street with very little cars because they just can’t fit through, red lanterns hanging from the trees and of course lots of people. There are lots of western eateries but enough great Chinese places to be able to avoid them. Yesterday though – we just couldn’t resist a nearby Thai Restaurant – I think Thai food is a lose second to Greek food in my favourite foods ladder. Speaking of food – I wonder if Mongolia will even get into my top twenty – I’m a bit worried about the food there since they are such a meat based culture – I can do ten days of dairy food as long as I don’t have to eat sheep testicle soup. I’m cringing as a I write! The kids are adamant they don’t want to eat horse meat – though are so excited that our home-stay family apparently has lots of horses. Kalika and I had some special time together as we tried to find the office from where to pick up our Mongolia Train tickets. It was difficult to find cause I am so bad at orientating maps at the best of times but I just couldn’t find the sun through the smog to help me with which way west was. Eventually we found CITS travel and got our tickets – Kalika got showered with ‘cute’ and given pens and they asked if they could take a photo for their Facebook page – ‘what I thought Facebook was banned’, ‘Yes it is but we have special permission since we are an international travel company’ – aha – loopholes! Lucky we found an incredibly yummy cake shop on the way home. The kids are getting a bit tired of monasteries and sacred sites etc etc though they were quite intrigued about the story of the 1989 Tianeman Square protests and why so many people died, why there are still 150 or so political prisoners in jail from that time and they would like to see that amazing picture of the lone protester who stopped the tanks. I said we would google it in Mongolia – I’m pretty sure we wouldn’t get through China’s firewall. Also, Yasi and Toby are getting used to the concept that history really depends on who’s writing and recording it – for their own purposes. It’s an interesting concept to try and impart. Anyway back to Tianeman Square (which we had to go through security to get to – even drink water from out bottles) it was eery being there cause I guess in 1998 I was a first year uni-student and it was probably the first time I took much interest in world politics so the images for me were still pretty vivid. Pretty vibrant also though – lots of families around out for a walk – lots of hawkers pretending they want to practice English (and then rip you off – we were warned of them by our hostel so I tried to respond in Greek to one guy – that quickly shut him up). A humongous Chinese flag with the most upright and rigid army guards near it – we were trying to make up a story of what would happen if their mobile phone was vibrating in their pocket and it was their girlfriend on the phone cause they were late for dinner – interesting scenarios abounded. 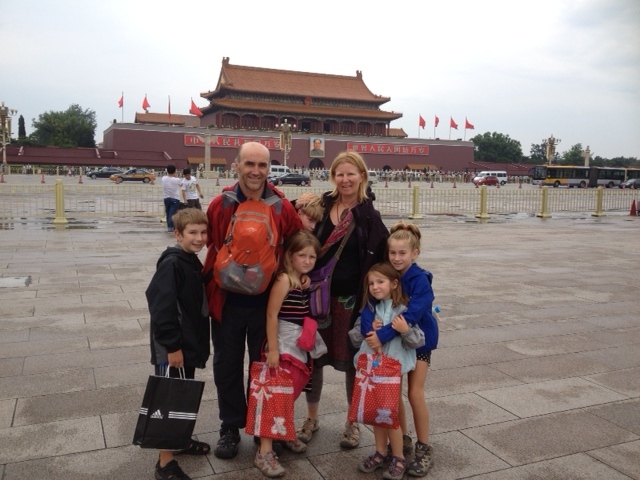 And of course – how could you miss the huge picture of Chairman Mao in his heyday! 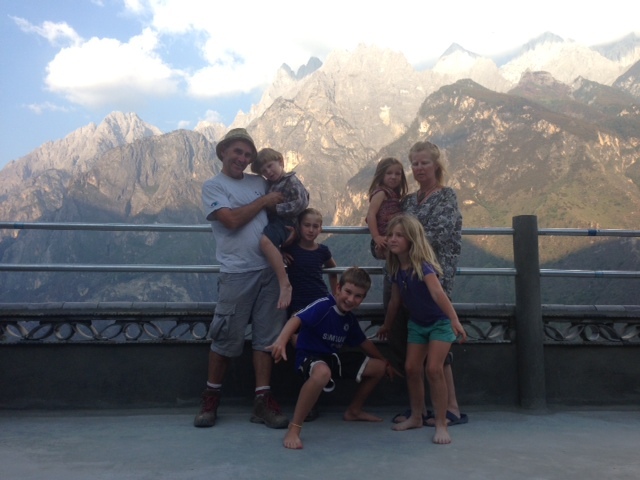 We are in Shuhe (near Lijiang), China. I loved lunch on Sunday we had street food it was 6 baked potatoes on a stick, I ate 3 sticks of potatoes!!! This is a short video of me ordering. Remember how I told you we wanted to get horses when we get back home- I want to do good natural horsemanship with our horses that we get, so me and mum are reading this book on my kindle that is called “Natural horsemanship” it is fun reading it because it tells you how to start and stop your horse with out kicking to go and pulling to stop!!! There is a way but I haven’t read it yet. We are looking in to Arab ( Arabian ) horses, we were looking at thoroughbred horses but mum said they’re often used in racing so they cost so much money. One thing natural horsemanship has taught me is not to make assumptions when riding on horse back. For example the book said ” if you did go to exercise your horse in arena when you got to the gate and got off if you do that 3 days in and row on the fourth day your horse will stop at the gate and wait for you to get off” so mum said ” when you do your daily exercise for your horse you will have to change your route daily so your horse doesn’t go faster when you turn around to go home. SO CHANGE YOUR ROUTE DAILY!!! Is the advice! P.S I have been looking for horses already and went on Gum tree last night and found a thoroughbred horse named Ollie he his an un-raced 2 and a half year old thoroughbred he is 15.2 hands, gentle natured and fine in a paddock with lots of hugs and hiss. He comes with a blanket, foal application, bridle and 2 halters and he is brown!!! We are very interested in him. Though he might not still be around in 2yrs time if he’s for sale now. At 4:30am we were at the Singapore airport on the way to K.L. We went to the bag drop and did all that stuff, then feeling rather hungry we went to find food I had a Chocolate muffin. We got small trolleys and I had the job of wheeling Zoi on the walkerlator while we waited to get into the security area. Our plane was Malaysian Airlines and it was only one hour and it had TV-which we haven’t had on any of our flights. I watched ‘Cars’ but I didn’t get to watch much because an hour came and went. When we were at K.L airport there as good WIFI so Yasi, mum, Baba and I were on our iPods and iPhones playing ‘Words With Friends’ which is like scrabble with friends. Then it was time to get on the plane to go to Kunming and guess what? On a 4 hour flight there was NO T.V. We were very annoyed!!! Since Malaysian are a partner with QANTAS I got to the captain to sign my Frequent Flyer passport and they let me sit in the cockpit at the end – it was exciting. For lunch on we had noodles, beef and potatoes a bowl of rice and chicken it was yummy, I found interesting how they made pasta by hand and it only took about 5 minutes to make a bowl of pasta. For once it was not spicy and was the first meal I have loved in China. 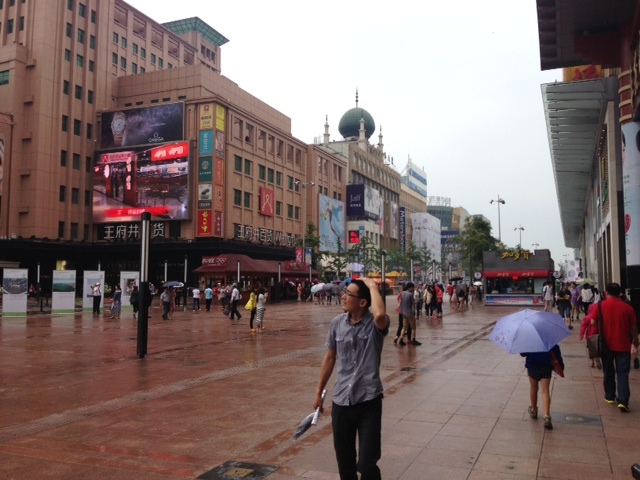 When we arrived a few days ago I thought I was not going to survive in China. We went on mountain horses to a village called Mapingguan. It was great fun. I loved the horses that I rode on, I also loved holding the reins it was fun because I had something to hold on to rather than a old fashion saddle that was difficult to hold for too long. I wanted to trot but the hills were way too rocky and steep to go trotting. Kalika, Yasi and I were into the spices, We said, “they put in too much spices in Kunming but a little bit of spices on corn and rice is just the best”. On the way back we only has 2 horses available, we all wanted to ride the 2 horses except Emilio so what did we do? We put 2 people on a horse. 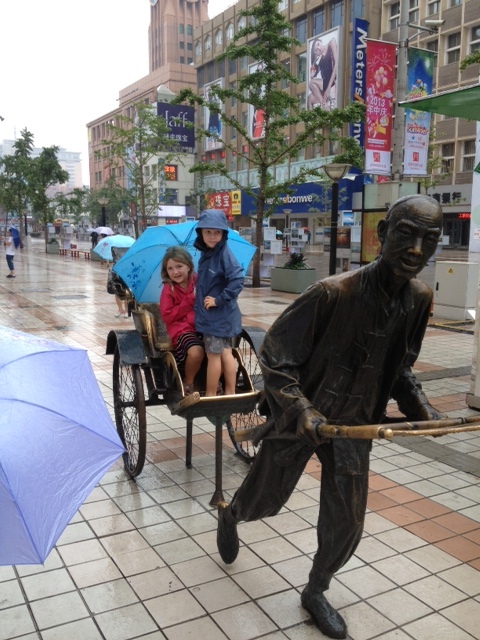 It was so bumpy that I almost fell off the wooden saddle. IT WAS WHAT? IT WAS FUN! 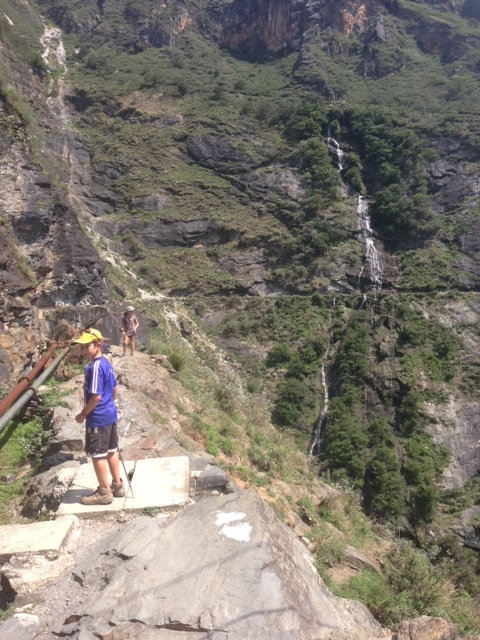 We did a 3.5 hour hike and I was tired in the first 50 m. We went from Shangri-La to a Tibetan village. I found it interesting to see lots of wild boar along the way. I got my record of 169 heart beats per minute. I was walking fast up a hill, at high altitude. I loved the chocolate coco pops chocolates and the dark chocolate doves that we had. We had a rest near where some yaks and cows were and we had some snacks, muesli bars and two Oreo biscuits that Yeshi brought. 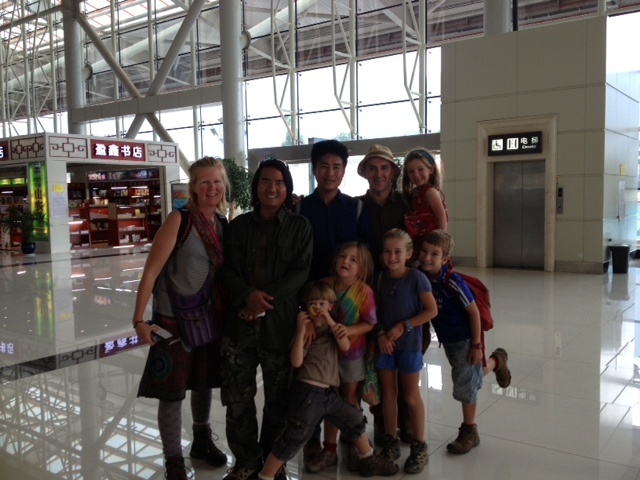 We were with Yeshi’ our tour guide from Back Roads of China and he let us use his walking/hiking sticks. There were some really big hills and when we were sitting down having a rest Yeshi teased us that a we had to go up another 45 degree hill, but the village we wanted was at the bottom of the hill we were on. As we were going down, Yeshi made a big scary noise and he was really close to me and I got a fright. When we were walking along the valley we saw two horses and a foal, when we were getting nearer I heard gun shots and didn’t know what they were. I started to think that a war was moving into town but they were actually just shooting birds for fun. When we were putting up our tent, about 7 children and three adults came to watch. The children were pushing each other on our tent. Shut the tent for some privacy but one old fellow opened the zip again to see what we we doing. I thought they were rather jealous and I thought they should treat things like your own- I didn’t like it. Then one dad came along and told the boys off and hit them and held up a stick to make them go away. By the time we got to dinner I was feeling pretty sick , but it was actually just exhaustion and I had a Headache. I told dad I was feeling sick and I only had one spoonful of rice. We had dinner at a pretty poor Tibetan family’s house. The things they had were not bad – there was just not much in their rooms. By the time we got back to our tent I was feeling really sick and as soon mum swapped my bed with Emilios ( because I was feeling so sick I wanted to be next to mum in the tent) I undressed and the minute I was undressed, the minute my head hit the sleep mat I was asleep, mum gave me some homeopathic medicine and then I was asleep again. What a day! Felt perfect in the morning.